With a new two-camera system, the camera on the iPhone 7 Plus is billed as being the most advanced in the world of cellphones. 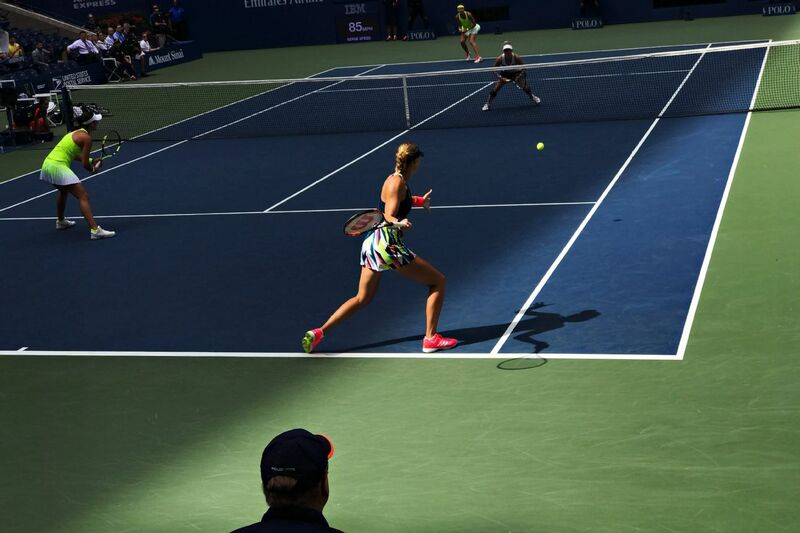 We put it to the test at the US Open, exploring the event in a whole new way. hen Novak Djokovic signs the case to your iPhone 7 Plus, you know you can't get any closer. Surprisingly, this is what happened to our photographer, Landon Nordeman, who joined the scrum of autograph-seeking fans swarming Djokovic as he made an impromptu public appearance at this year's US Open. With an exclusive opportunity to photograph the US Open with an unreleased iPhone 7 Plus, Nordeman documented the world's greatest tennis tournament from the intimate perspective of a participant. Working with the new two-camera system on the iPhone 7 Plus encouraged Nordeman to react instinctively and quickly to the moments he discovered around the grounds while looking like another fan. The autofocus and exposure performed exceedingly well in various lighting conditions -- so that even with one hand, he could get the shot. Nordeman was able to execute his signature style -- surprising moments from unique perspectives, using color and composition without distracting his subjects -- in a fresh way by using the phone instead of a big camera lens and flash. Spectators wearing stars and stripes watch action on the big screen in front of Arthur Ashe Stadium. During the men's collegiate invitational quarterfinal, Thai-Son Kwiatkowski returns a shot beyond the baseline to Michael Redlicki on Court 5. Kwiatkowski would go on to win the match. Shielding himself from the sun, a fan is perched above Court 7 taking in action on Day 11. An official tests the tennis balls before putting them in play during the mixed-doubles final at Arthur Ashe Stadium. Doubles team Laura Siegemund and Mate Pavic defeated Coco Vandeweghe and Rajeev Ram. Stefanos Tsitsipas of Greece, the top-ranked junior player in the world, plays against Kenneth Raisma from Estonia on Day 12. Tsitsipas would go on to lose in the semifinals. A spectator snaps a photo of Martina Navratilova while holding a bucket of fries during the women's championship doubles semifinals. Navratilova and Arantxa Sanchez Vicario defeated Tracy Austin and Gigi Fernandez but would go on to lose in the finals. On a day during which temperatures reached 90-plus degrees, fans found spots of shade to rest and take a break from the heat near the South Plaza of the US Open grounds. A tennis fan places her designer bag on a hanger in box seats at Arthur Ashe stadium before the men's singles semifinal matches got underway. Using a scarf to protect himself from the sun, a spectator leaves Court 6 after watching the women's championship doubles semifinals on a 90-plus degree day. During a break in play at Arthur Ashe Stadium, umbrellas shield players from the sun on an intense day of heat. Stage act Moz Drums, from Lille, France, sit in the Green Room before performing an interactive LED light and drum show at Arthur Ashe Stadium and through the grounds. Serena Williams takes questions in a media interview room after her semifinal loss to Karolina Pliskova on Day 11 of the 2016 US Open. Tennis rackets are placed on seats in the Wilson box at Arthur Ashe Stadium as a gift for guests. Sporting a color-coordinated outfit, Humberto Becerra, who traveled from Chile for the US Open, surveys the grounds. Flag-bearers leave Court 5 after presenting during the ceremony for the men's collegiate invitational winner. Pablo Carreno Busta, with partner Guillermo Garcia-Lopez of Spain, serves to Jamie Murray of Great Britain and Bruno Soares of Brazil during their men's doubles final match on Arthur Ashe Stadium. Murray and Soares would go on to win the match. Professional salsa dancer Kirsten O'Brien dances with spectator Damian Mojica in Kevin's Corner near Louis Armstrong Stadium to music played by the DeJesus Latin Band. Friends Richard Williams (red shirt), Frank McMickens (orange shirt) and Atno "Smitty" Smith (blue shirt) broke out their special occasion pants on Day 13. The trio bought tickets for the women's final for a second year in a row in hopes of seeing Serena Williams compete. Lindsey Peterson, 24, an assistant buyer at Saks, sports a vintage 2015 US Open headband as a neckpiece and a tennis ball signed by Serena Williams. A ball boy places tennis balls on the racket of Austin Smith, a student-athlete at the University of Georgia, during his match against Thai-Son Kwiatkowski in the men's collegiate invitational final on Day 13. Former Australian tennis champion Pat Cash leaves the courts after a round of practice on Day 13. Cash and partner Mark Philippoussis won the men's champions doubles, defeating John and Patrick McEnroe on Sunday. USTA employee Jenna Higueras holds a photo of friend and former colleague Jeremy Fehrs as she watches action on Court 5. Jenna and coworker Lisa Cassels are taking photos of Fehrs throughout the grounds and sending them to him since he loves the tournament. Outside Arthur Ashe Stadium, the United States Marine Corps, 6th Communications Battalion from Brooklyn, New York, folds the American Flag used in the opening ceremony for the women's championship. Steven DiPeso helps his son Leonardo walk down the steps outside Arthur Ashe Stadium during the women's championship. Ligaya Murray, 8, from Yonkers, New York, plays with her family on the grounds during Day 13 of the US Open. Angelique Kerber falls to the ground in celebration after her victory in three sets against Karolina Pliskova in the women's final. Kerber will become the new No. 1-ranked women's tennis player in the world. Novak Djokovic makes an unplanned public appearance and signs autographs for fans. The sun sets over the iconic New York City skyline from the top of Arthur Ashe Stadium after the conclusion of Day 13. As the roof casts a shadow across the court at Arthur Ashe, Caroline Garcia and Kristina Mladenovic serve to Bethanie Mattek-Sands and Lucie Safarova during the women's doubles final on last day of the US Open. Mattek-Sands and Safarova won the match. Ivanka Trump arrives at the US Open with her husband, Jared Kushner, before the men's final between Novak Djokovic and Stan Wawrinka. Before taking his seat to watch the men's finals, a spectator holds his dog companion that he brought along to Day 14 of the US Open. The crowd erupts during the men's final between Novak Djokovic and Stan Wawrinka on the last day of the US Open. Men's champion Stan Wawrinka holds the US Open trophy after defeating Novak Djokovic in four sets. Streamers are cleaned up on center court after the trophy presentation.